What have Anna Pavlova, Pablo Casals, Placido Domingo, Ravi Shankar, Rudolf Nureyev and Marcel Marceau got in common? All have, at one time or another, trodden the boards of the majestic Teatro Degollado, Guadalajara’s cultural centerpiece that later this year will mark 150 years since its “first” inauguration. The above-named garlanded performers followed in the footsteps of soprano Angeles Peralta (“The Mexican Nightingale”), who sang the title role in Gaetano Donizertti’s “Lucia de Lammermoor” before an overflow audience at the theater’s opening gala on September 13, 1866. Both Peralta and Jacobo Galvez, the theater’s architect, received a thunderous ovation, a local newspaper then reported. For Galvez, however, building the edifice over the previous decade had been a personal struggle, as he found himself caught up in the bitter Reform War, the civil conflict between liberals and conservatives that split the nation in two. Santos Degollado Sanchez, a former law professor who became governor of Jalisco, conceived the idea of building a monumental structure to house the city’s most important cultural events. To choose the architect for his great theater, Degollado organized a contest, which was won by Galvez, a Tapatio with liberal leanings. 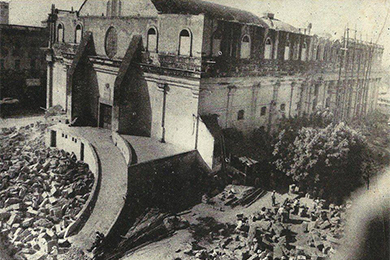 Construction began in March 1856, with Degollado laying the cornerstone. The site chosen was the place where tradition says the city was founded on February 14, 1542. In 1858, the liberal government fell and Galvez fled the city. Work was suspended but the architect – eventually granted political immunity by the conservatives – returned the following year to finish the most important project of his career. When the conservatives controlled Guadalajara the theater bore its original name of Alarcon, in honor of the renowned Mexican dramatist Juan Ruiz de Alarcon y Mendoza. When the liberals held power it was called Degollado. The name changed four times, with Degollado finally prevailing, shortly after the building’s inauguration in 1866. Construction of the theater’s famous boveda began in 1859. Gerardo Suarez, a disciple of Galvez’s, helped paint the impressive mural of a scene from Dante’s “Divine Comedy” that decorates the dome. The liberals had retaken Guadalajara in 1861, the year that Degollado, who President Benito Juarez had appointed secretary of war and commanding general of the federal forces, died in battle.